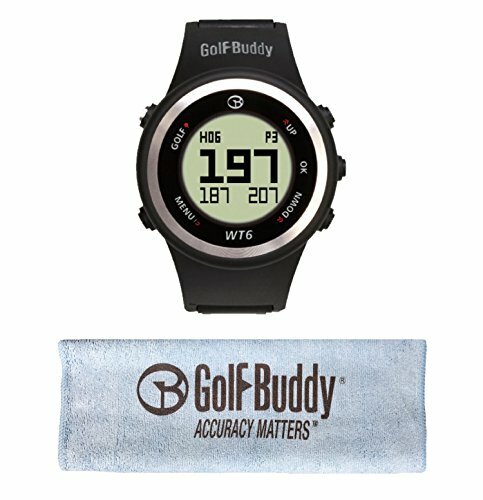 Never second guess your distance again with the GolfBuddy WT6 GPS Watch. Capable of holding details for 38,000+ courses, the WT6 features automatic course and hole recognition for out-of-the-box functionality. A dedicated golf button easily allows you to shift the device into GPS mode for hassle-free use. The dual green distance display and yardages to the front, center and back of the green ensure you pull the right club as you prepare your shot. With the new WT6's popular design and comfortable fit to your wrist, you can fully utilize features with simple press-and-hold buttons. The GolfBuddy WT6 is a fully functional digital wristwatch with a rechargeable battery.